The E-Team is excited to share in a fun blog hop with the Want2Scrap™ Design Team. 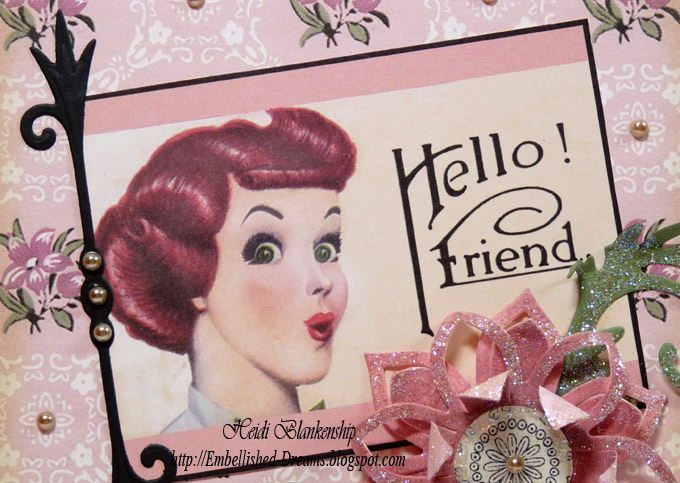 If you are new to eclectic Paperie or Want2Scrap, here is a little information about these two creative companies. 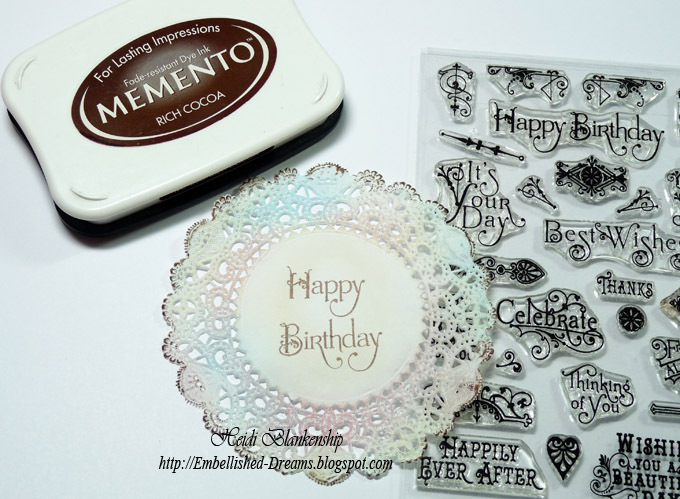 Each offer unique lines of products for all paper crafters. Twice the number of blog hop participants means twice the fun that includes prizes, too. Visit each E-Team and Want2Scrap participating member and leave them some feedback about their creations. One comment per person, per blog, please. You have until today, Friday, September 30th to Sunday, October 2nd to visit each blog participant. Six random winners will be chosen from the blog hop participants. 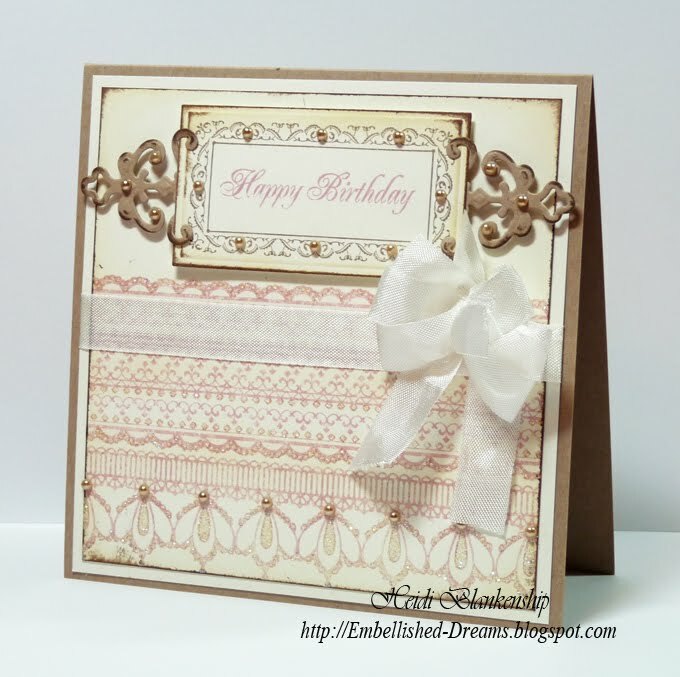 The six winners will win either a $20.00 gift voucher from eclectic Paperie OR Want2Scrap. Each company is giving away three (3) $20.00 gift vouchers. Winners be posted on the eclectic Paperie Blog and on the Want2Scrap Blog on Tuesday, October 4th so make sure you check back to claim your prize. 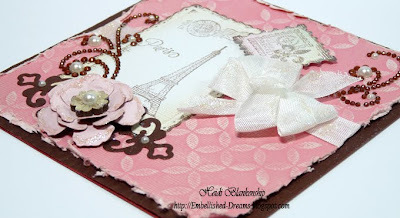 Here is the card I designed for the blog hop. 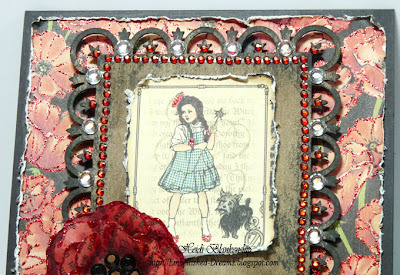 I used Graphic 45 The Magic of Oz Collection for the designer paper. The Wizard of Oz has always been one of my all time favorite movies so it makes designing with the Graphic 45 papers so much fun!! I used the Nestaboard™ Fleur de Lis Rectangle and I inked it with Walnut Stain Distress Ink and Memento Tuxedo Black ink. Then I added Nestabling™ Fleur de Lis Rectangle Red/Silver Rhinestones and added the image of Dorthy to the center. 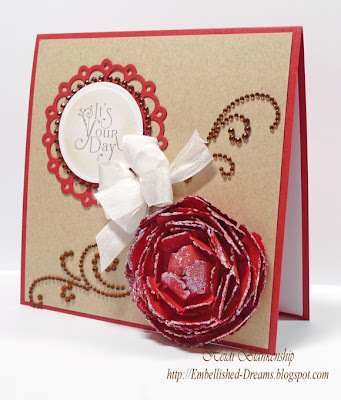 To create the flower I used old book pages and S5-050 Rose Creations die template from Spellbinders™. I added color to the flower using Copic markers and then I added Black Rhinestones to the center of the flower. 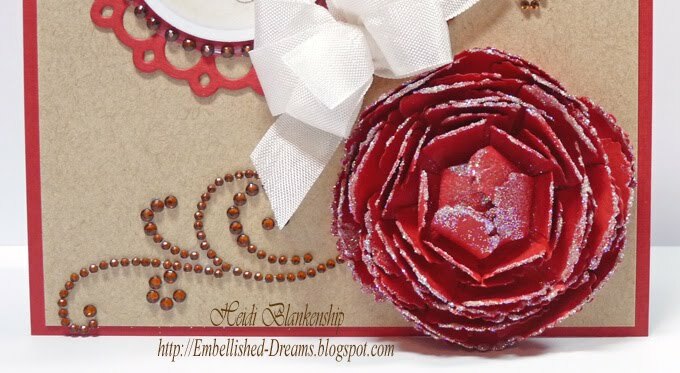 I also added Xmas Red Stickles to the flower and designer paper. Thank you so much for stopping by today!! I hope you have a Fabulous weekend!! Good morning! 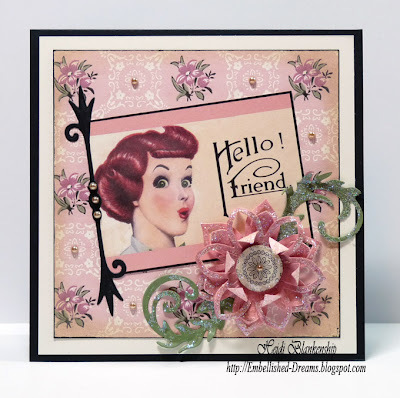 I have another card to share with you today revealing not just one but two New Release stamp sets from JustRite Stampers! The two New Release stamp sets are JB-10010 Grandma's Doilies and JB-10015 Old Friends. 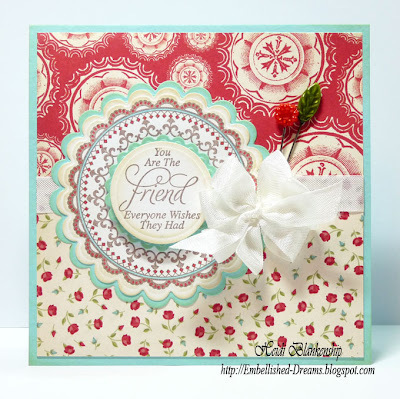 The Grandma's Doilies set includes 4 Designer Centers and 4 Interchangeable Borders. The stamps look like antique doilies, the detail is amazing! 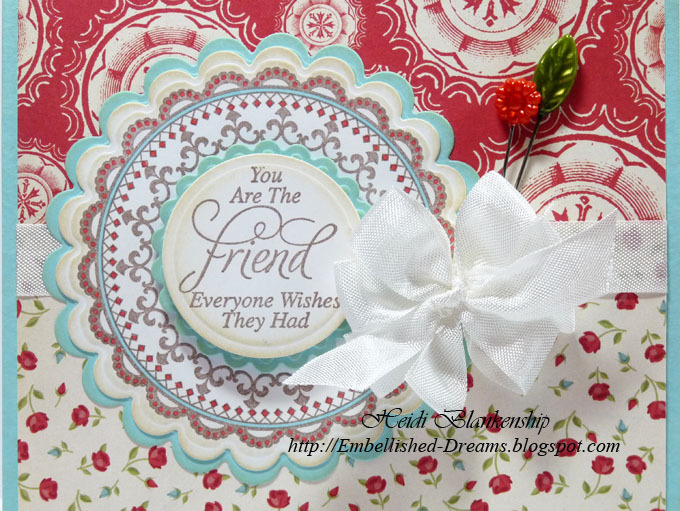 The Old Friends stamp set includes 6 Designer Centers with wonderful friendship sentiments and 6 Interchangeable Borders. Here is a close up. 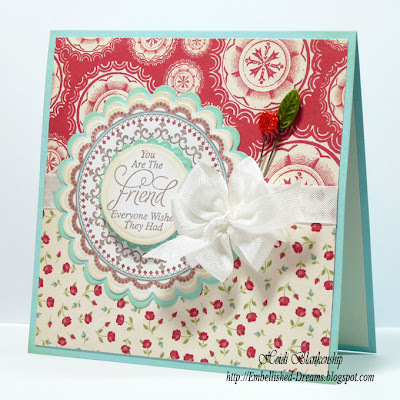 I used S4-Classic Scalloped Circles Small to match up with the Grandma's Doilies stamp set and S4-114 Standard Circles Large for the Old Friends stamp set. 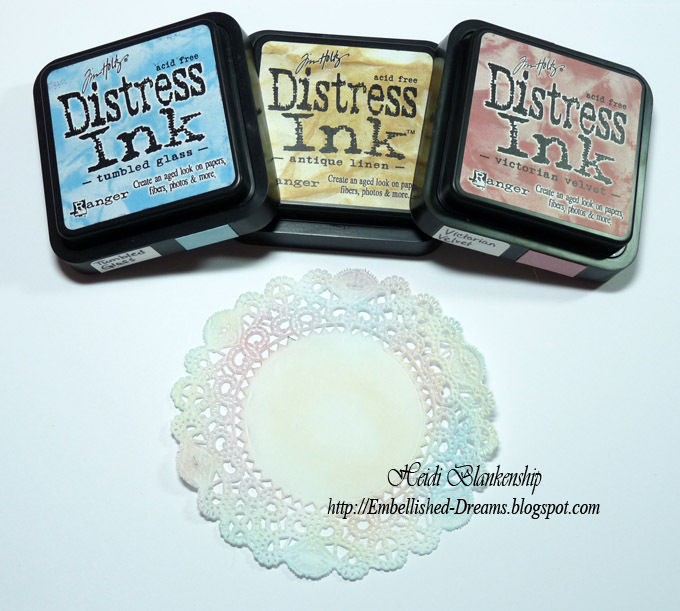 I added a little color to the stamped images using Copic markers and inked the edges with Ranger Antique Linen Distress Ink. I layered the die cuts and added a seam binding bow and a couple of trinket pins. The designer paper is from Cosmo Cricket Odds & Ends Collection and the cardstock is from Discount Cardstock. As part of JustRite's October Release they are introducing QR codes to all their new packaging and their catalogs. QR codes are popping up everywhere and you may have wondered what they were. What is a QR (Quick Response Code)? QR codes are pixelated squares that you can scan with a smart phone app. Scannning the QR code with your phone will bring you directly to a website or landing page. The JustRite QR Codes on the packaging and in JustRites Catalog will link a stamp set to JustRite's Design Gallery for that set. Now you can scan the code with your phone to see what your favorite designers have created with a set before you purchase the set in your favorite store. 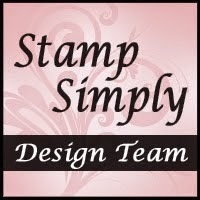 You can use your smartphone to access the design gallery for your stamp set from your craft room when you are ready to use your set or from our mini flyers or catalogs when you are sitting in a car waiting to pick up your child from a sporting event!! You may already have a QR code scanner already on your phone - if you don't you can upload any of these apps - for your iPhone - Red Laser (free), NeoReader (free), Optiscan ($1.99) For your Android Phone - QR Droid. Blog Candy Alert - Blog Candy on the JustRite Blog is a $ 50.00 shopping Spree. To enter to win go to the JustRite Blog and answer the blog candy question. 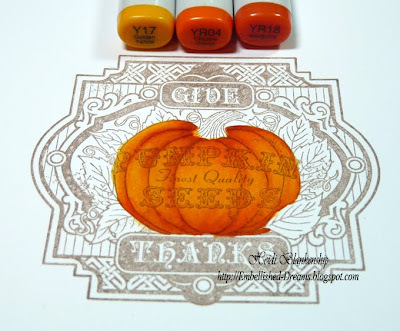 The Blog Candy is open for comments until Friday Night at 12 pm EST. The winner will be announced on the JustRite Blog on Monday October 3rd during the release post. Good luck to everyone! Please be sure to visit each of the JustRite Design Team Members to see what they have been busy creating with these two fantastic stamp sets! Thank you so much for stopping by today! I hope you have a wonderful and creative day!! Good morning blogging friends! 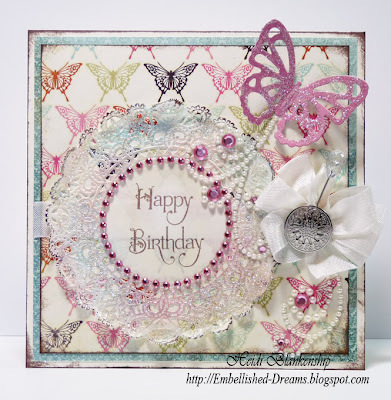 Today, I have a card to share with you using the New Release, CL-02205 Lace Borders from JustRite Stampers. I love all the details of the lace trim stamps! I think this is going to be one of those go to sets for me. 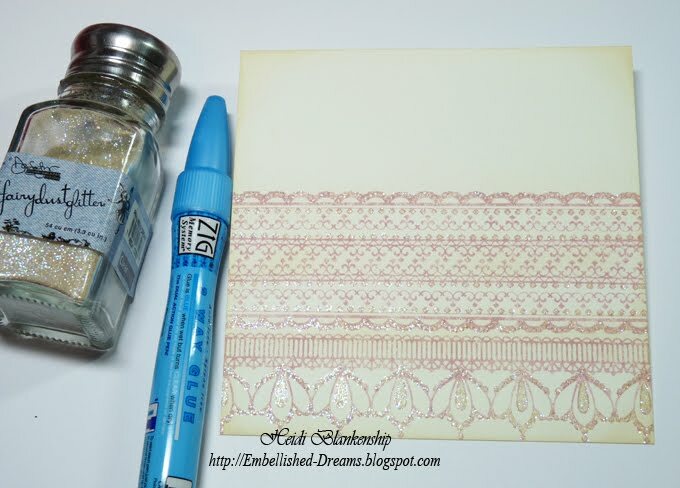 There are so many possibilities with the CL-02205 Lace Borders and you can mix and match them. For my card I used three of the border stamps in the set. By turning the stamps and stamping several layers I was able to create a wide lace border. 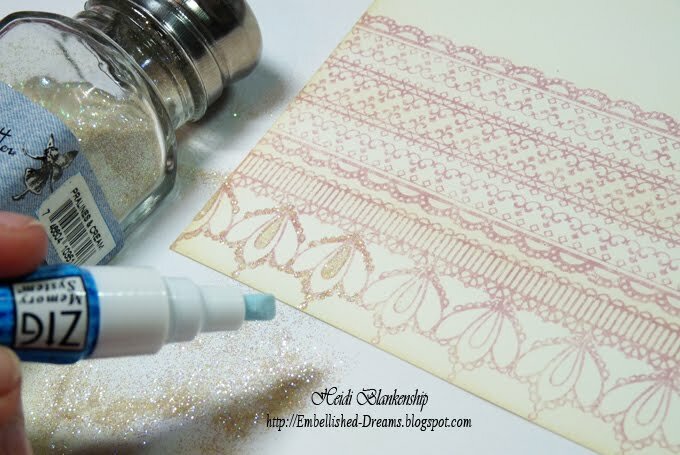 After I had all of the stamping done I added some glitter to the lace trim using a 2 way glue pen and Pralines & Cream Fairy Dust Glitter. Here is a picture once all of the glitter was applied. You can see the sparkle from the glitter on the lace trim in this photo. 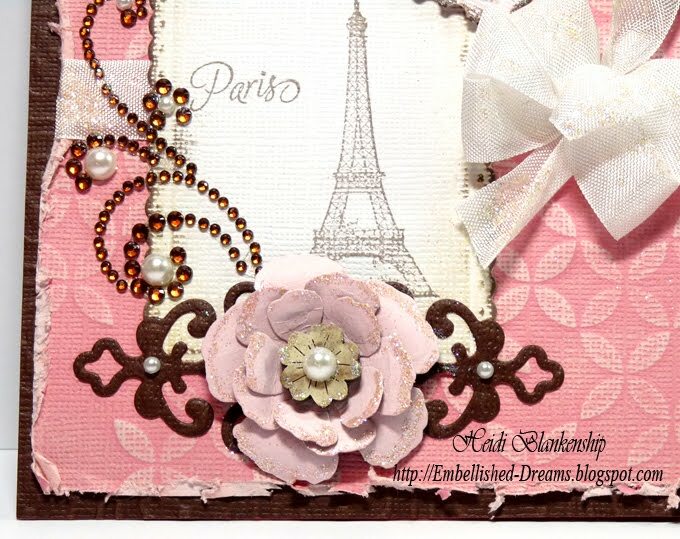 I applied Baby LeCreme Pearls from Want2Scrap along the bottom and at the top by the sentiment. For the sentiment I used JB-09200 Baroque Nested Frames and JustRite Nested Frames Custom Die Template. 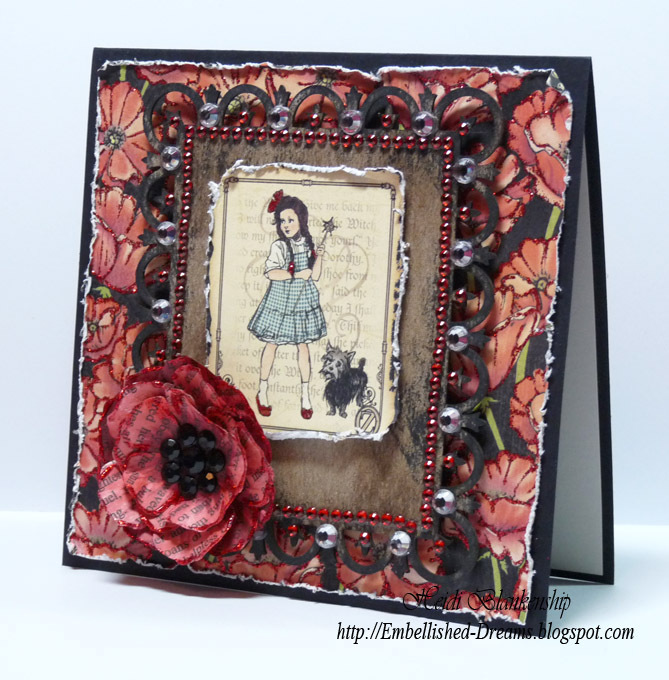 For the accent pieces I used S5- Ironworks Motifs from Spellbinders. For a finishing touch I added a seam binding bow. 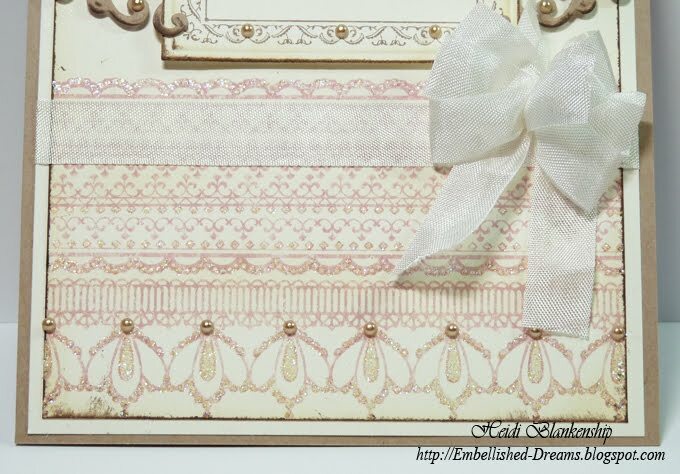 Please be sure to check out the JustRite Design Team Members and see what they have creates using the New CL-02205 Lace Borders stamp set! Thank you so much for stopping by today! I hope you have a wonderful day!! Good morning blogging friends! 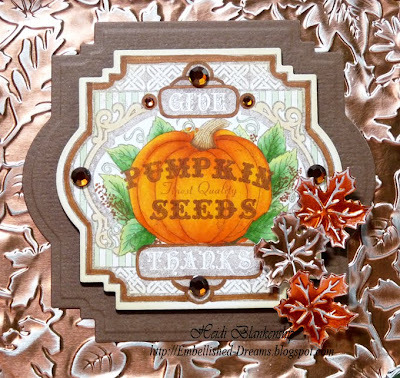 Today, I have a card to share with you using the New Release CL-02200 Autumn Labels Twenty-Two from JustRite Stampers. 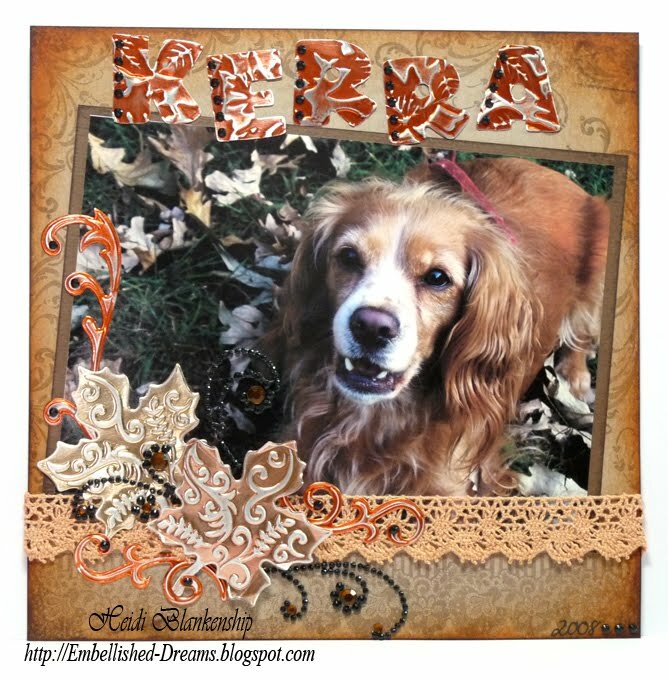 The CL-02200 Autumn Labels Twenty-Two stamp set is a beautiful set of 6 stamps--four of the stamps match S4-346 Labels Twenty-Two from Spellbinders™ and two of the stamps are sentiments. To start I stamped the image with Rich Cocoa Ink on to Simply Smooth White Cardstock and then I started to add color to the image with Copic markers. 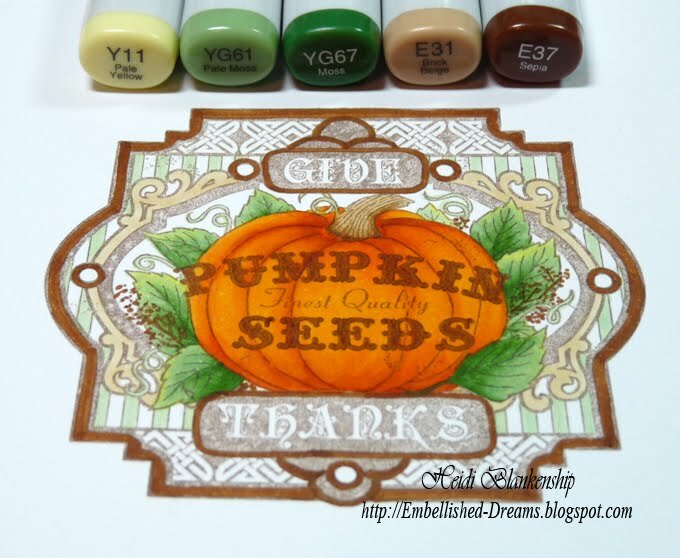 I just love this image from the stamp set and it's a fun one to color! 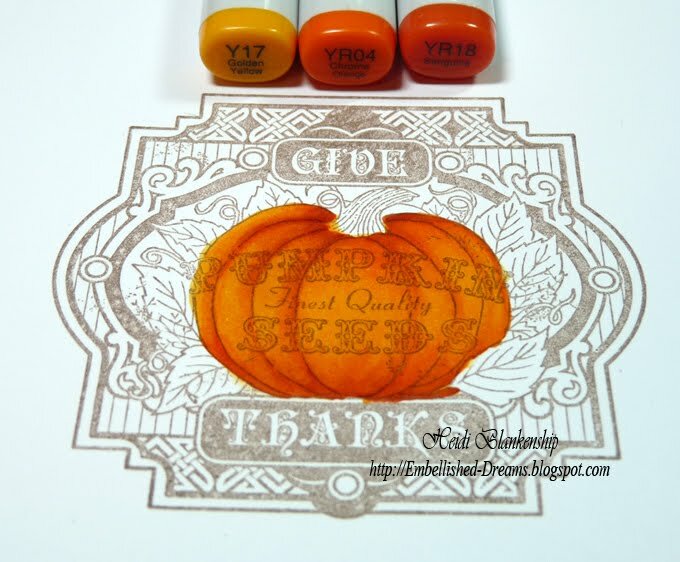 After I finished coloring the image I used the Grand Calibur™ and S4-346 Labels Twenty-Two to cut/emboss the label shape. Then I used 3-in-1 Advanced Craft Glue to adhere the die cut to a piece of matching Nestaboard Labels Twenty-Two from Want2Scrap™. Here is a close up of the image. I also used Spellbinders Premium Craft Foil Precious Metals (Copper), Jewel Tones (Orange) and S5-073 Orchard Harvest Tags and Accents to create the little leaf shapes. I sanded the foil leaves and it made the embossing really pop. I added some 72 Count Brown Rhinestones from Want2Scrap™ on the image and the outer corners. 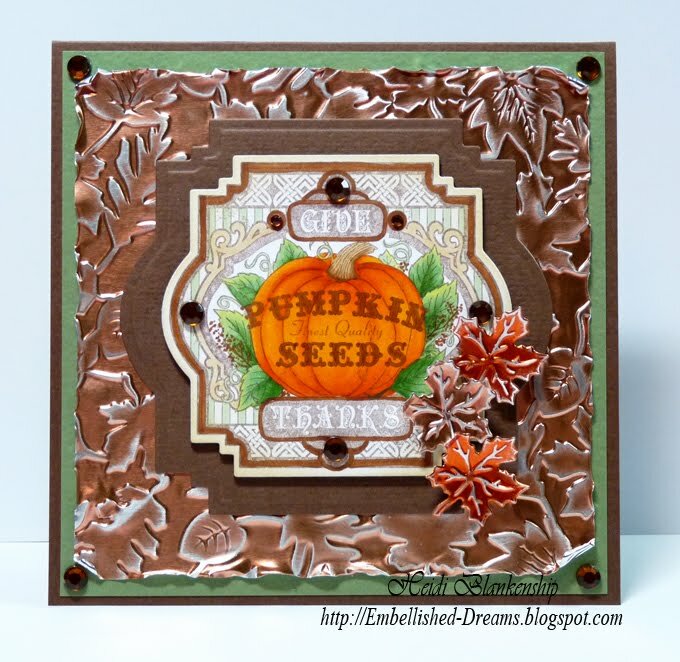 I used Spellbinders Premium Craft Foil Precious Metals (Copper) and Grand Impressabilities GI-001 Fall Splendor to emboss the beautiful leaf pattern and then I lightly sanded the embossed areas and distressed the edges. 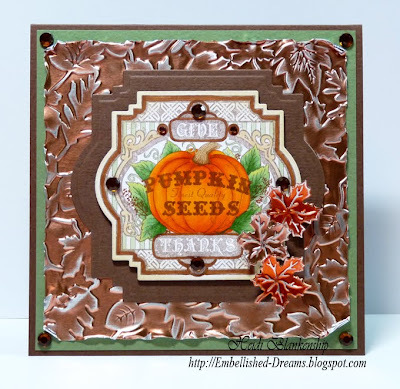 Please be sure to stop by each of the JustRite Design Team Member's Blogs and see what they have to share with you using this beautiful new Autumn Labels Twenty-Two stamp set. Thank you so much for stopping by today! Have a happy and creative day!! 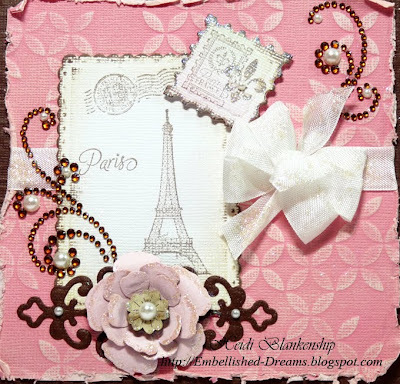 Welcome to the Spellbinders and Core’dinations Blog Swap! 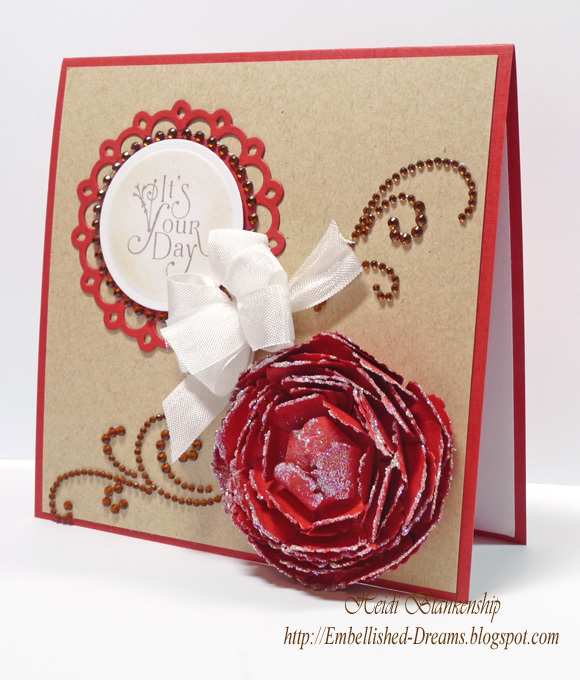 Cardstock® to showcase the wonderful ways our products work together! Hello blogging friends! Today, I have a card to share with you using three different collections from Core'dinations ColorCore Cardstock. 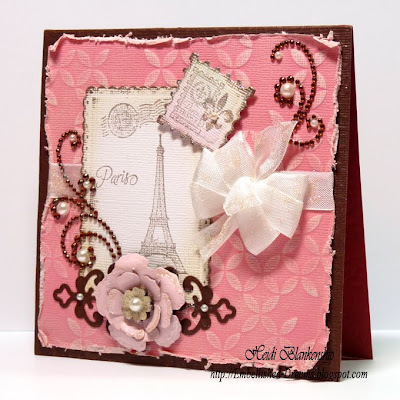 I used the BasicGrey Collection Whimsy for the card base, pink embossed mat piece, brown ironwork die cut. For the flower I used the pink side of the Chocolate Box Collection (brown/pink) and the white with the stamped images is from the Super Assortment. I sanded the pink embossed cardstock from the BasicGrey Collection Whimsy and then I used the Distrezz-it-All tool to distress the edges. Then I stamped the image on to the white cardstock using Rich Cocoa ink. 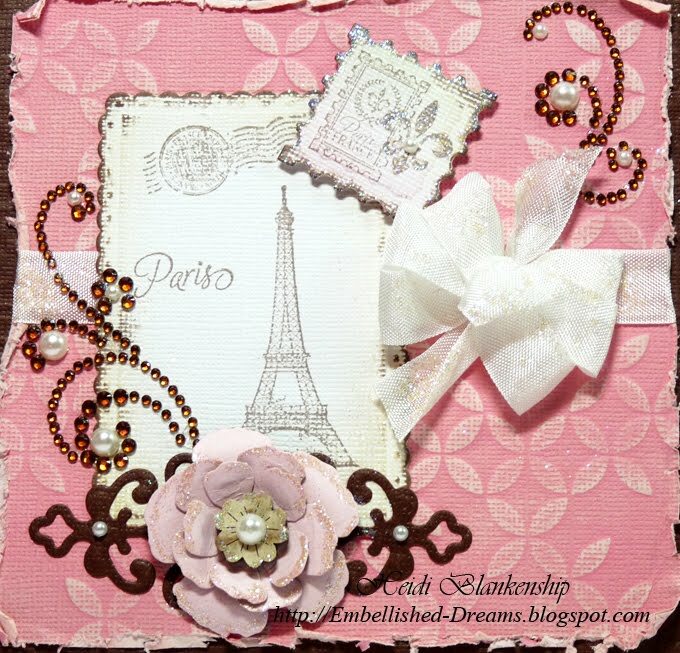 The stamps are from JustRite Stampers Cling CL-02185 Bon Voyage and CL-02195 Greetings From Paris. 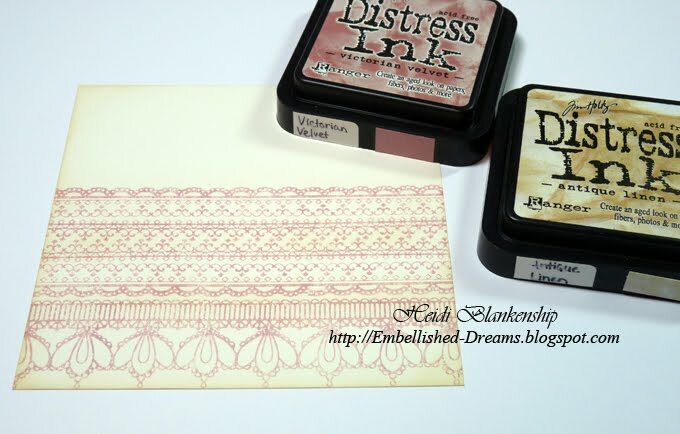 I used LF-002 Creative Book Pages Two and S4-348 Postage Stamp to create the die cuts and I inked the edges using Ranger Bundled Sage, Antique Linen, Victorian Velvet Distress Inks. Then I inked the edges again with Rich Cocoa. Here is a close up of the postage stamp. I used Glue Gloss and added Pralines & Cream Fairy Dust Glitter from Clearsnap to the stamp and seam binding bow. 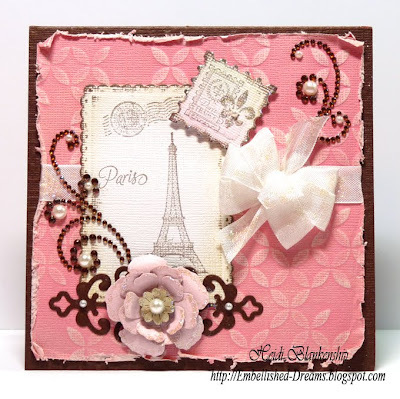 To create the flower I used the pink side of the Chocolate Box Collection (brown/pink) and S5-050 Rose Creations die templates from Spellbinders. I shaped the petals, then glued the layers together and added a button from My Mind's Eye and a White Pearl from Want2Scrap™ to the center of the flower and edged the flower with glitter. 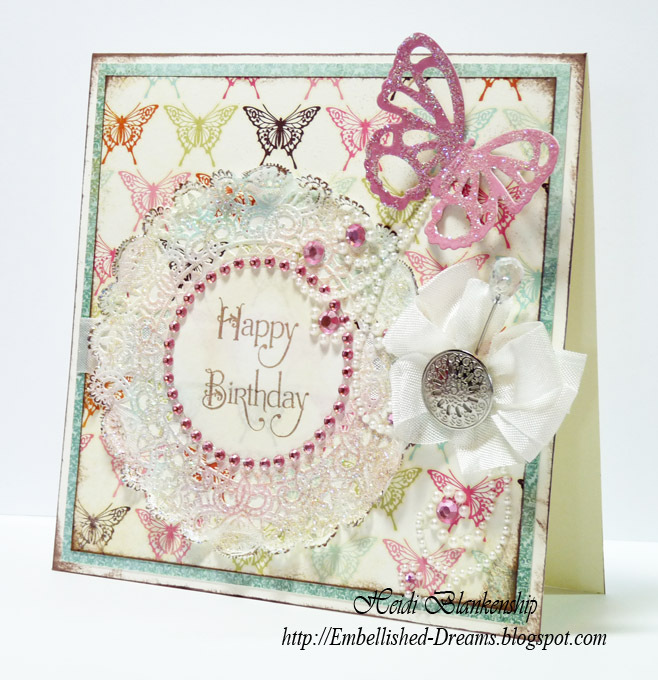 I used S5-059 Ironwork Motif and BasicGrey Collection Whimsy to create the accent die cut. For a finishing touch I added some Finesse Swirls Brown Rhinestones and 72 Count White Pearls from Want2Scrap. 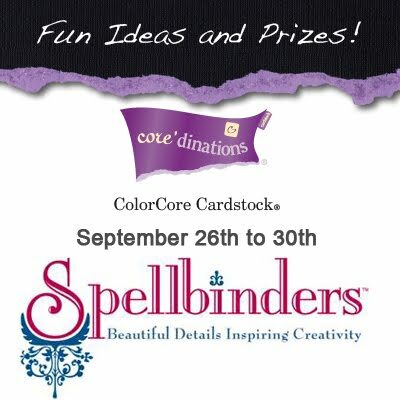 The Spellbinders Blog and Core'dinations Blog will be posting daily link list to the designers for each day of the Spellbinders and Core’dinations Blog Swap! 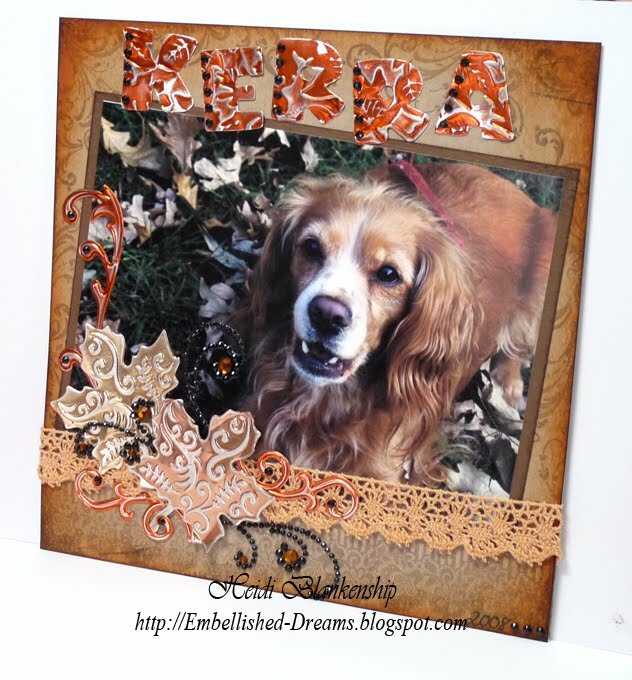 Spellbinders on Facebook, Twitter and the Spellbinders Blog! perfectly accents their patterned papers. But there is more! 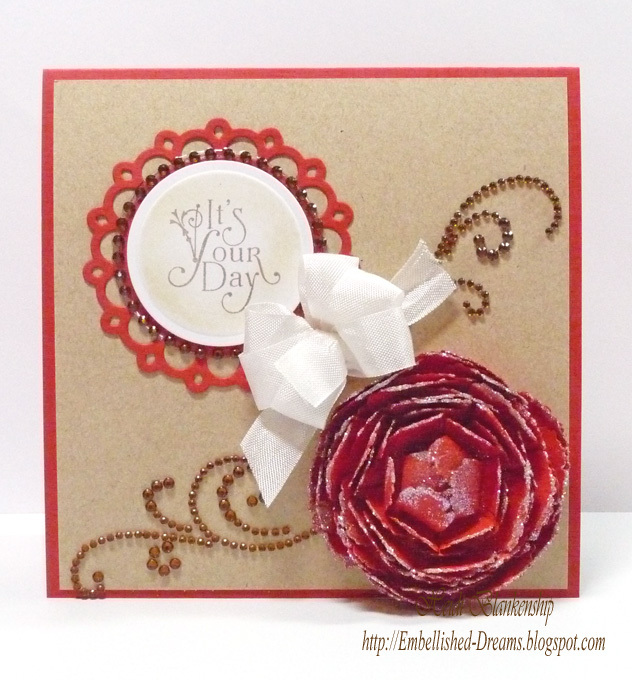 Check out Core’dinations Website, Blog and Facebook for the new Cardmaker Series, Kraft-Core and various other wonderful cardstock lines. Be sure to leave a comment to enter for some great prizes!! Thank you so much for visiting today and I hope you enjoy the blog hop!! I love adding dimension to my layouts and I know that doesn't always work the best when putting them into an album but this one is going on an easel and I am going to use it as a home decor piece. I love to have layout out around the house for display and to enjoy them. I started out with a piece of Kraft paper and then I used one of the lace borders from Crafty Secrets Antique Trims stamp set. 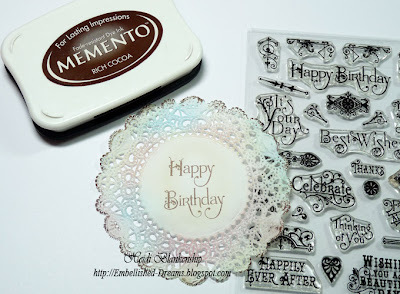 Next I stamped flourishes around the outer edges using Crafty Secrets Flourishes stamp set. I used Rich Cocoa ink to stamp the images. Then I inked the edges of the paper with Ranger Rusty Hinge Distress Ink and inked the outer edges with Rich Cocoa. 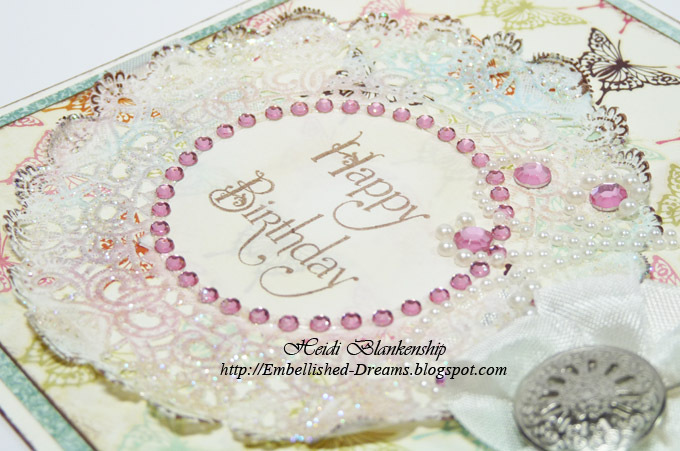 To create the letters for the title I used the Grand Calibur, LF-003 Donna's Alphas die templates and Premium Craft Foils Jewel Tones from Spellbinders. First I cut the letters and then I used the Grand Impressabilities GI-001 Fall Splendor to emboss the leaf print into the foil and then I sanded the foil. I added some Baby Bling Black Rhinestones to the side of each letter. 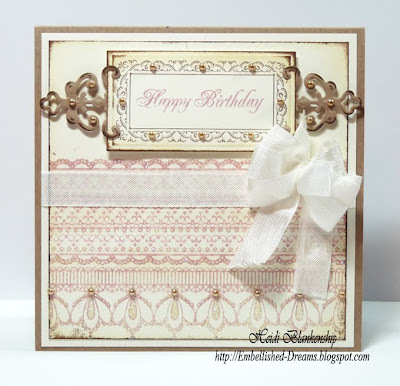 You can also see a close up of the Flourish stamps along the edge of the paper. Here is a close up of the flourishes and leaves. I used Premium Craft Foils Precious Metals and Jewel Tones and S5-071 Twisted Metal Tags and Accents, S5-073 Orchard Harvest Tags & Accents to make the flourishes and leaves. After I cut/embossed the foil then I sanded it. 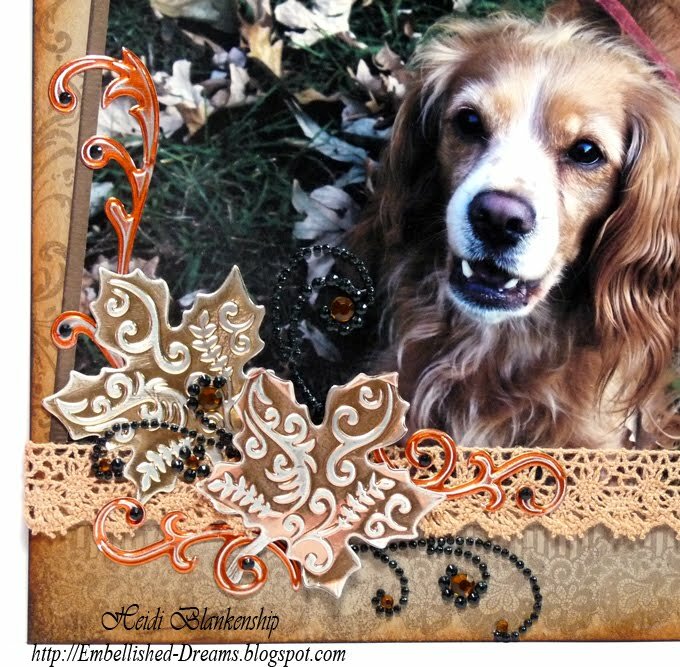 I also added a piece of lace trim and Finesse Swirls Black Rhinestones and 72 Counts Brown Rhinestones from Want2Scrap™. Here is a close up of the Antique Trims lace stamp from Crafty Secrets. Thank you so much for stopping by today! I hope you are enjoying your weekend!! Hello blogging friends! 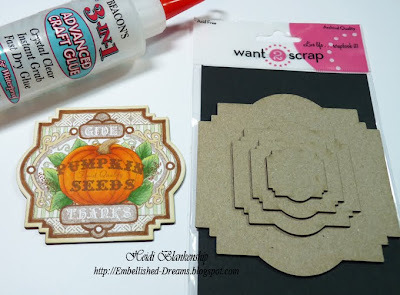 Today, I have a tutorial to share with you showing another way to use a piece of Nestabling™ from Want2Scrap™ even if you don't have a die template. 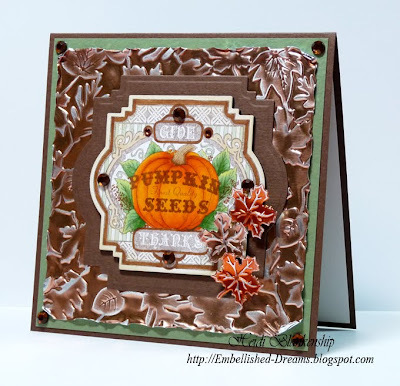 Instead of using a die cut I used a 4 inch doily for my focal point and stamping base. I started by inking the doily with three colors of Distress Ink--Tumbled Glass (blue), Victorian Velvet (rose) and Antique Linen. Next I stamped a sentiment in the center using the Grand Greetings stamp set from Crafty Secrets and then I inked the edges with Rich Cocoa ink. Then I added the Nestabling™ to the doily. The third circle of the Nestabling™ Heart Circles Pink Rhinestones fits perfectly in the center of a 4 in doily! Gotta love that!! When you are using your Nestabling™ sometimes it can be a lot of fun to think out of the box and look at other ways you can use it. 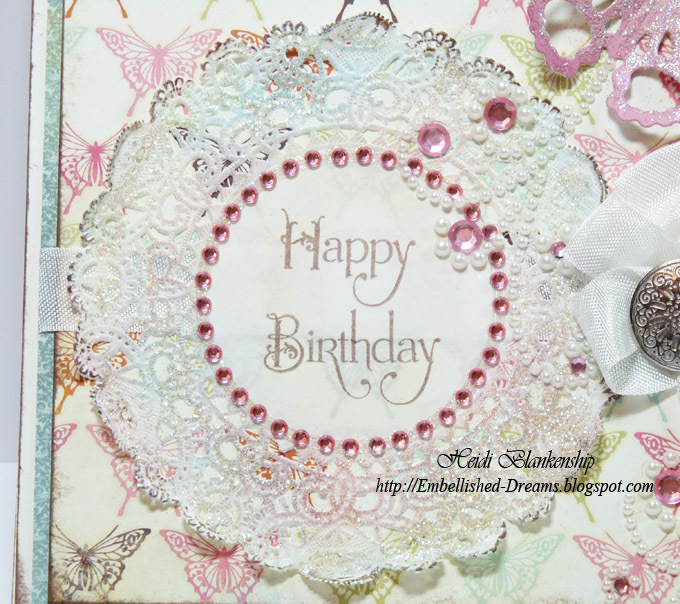 To add a little sparkle I used Glue Gloss on the Doily and then added Pralines & Cream Fairy Dust Glitter. Here are a couple of close up pictures. I used LF-006 Wonderful Wings die template to create the butterfly in the corner and then I added some glitter, Finesse Swirl White Pearl and 72 Count Pink Rhinestones. I also added a seam binding bow, trinket pin and button. The card base is Simply Smooth Ivory from Discount Cardstock and the designer paper is from the Vanity Fair Collection by My Mind's Eye. Thank you so much for stopping by today and I hope you have a Wonderful weekend!! 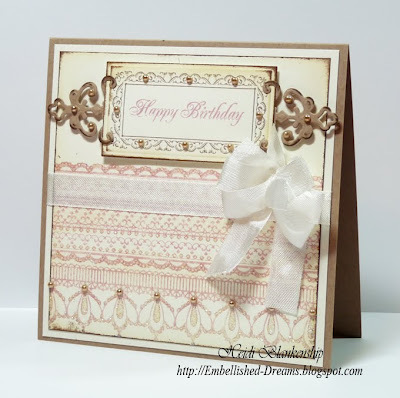 All of the card stock is from Discount Cardstock and this week the Straw 110# is on sale. Click HERE to check out all of the details. I also used Posh Wagon Red Dungaree and Simply Smooth White card stock. 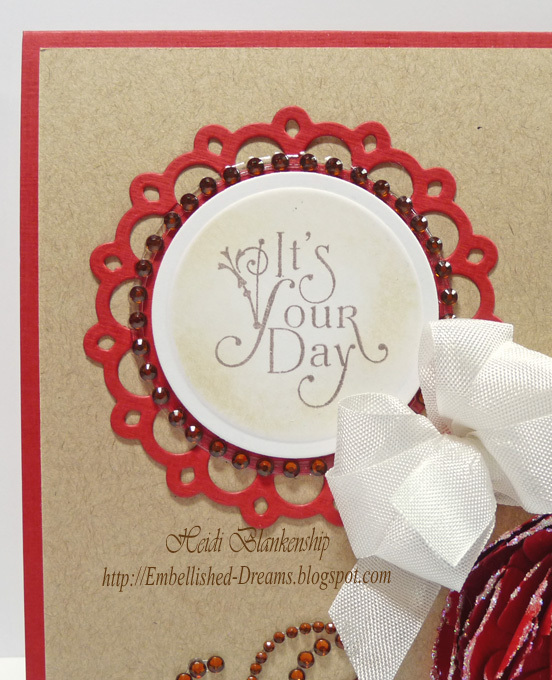 I stamped the sentiment from Crafty Secrets Grand Greetings stamp set on to Simply Smooth White card stock and then I used the Grand Calibur and S4-114 Standard Circles Large to cut/emboss the circle shape. Then before removing the paper from the die template I used it as a stencil and inked the inside edges using Ranger Antique Linen Distress Ink. I used the Posh Wagon Red Dungaree and S4-345 Picot Edge Circles to create a decorative edge circle shape and then added the Nestabling™ Heart Circles Brown Rhinestones from Want2Scrap™ and layered the two pieces with 3D Foam Squares. 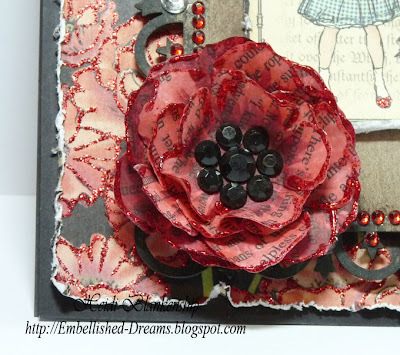 To create the beautiful and sparkling flower I used Posh Wagon Red Dungaree and LF-005 Grand Peony Creation. I die cut several layers of the flower, shaped it, layered and glued the pieces together. 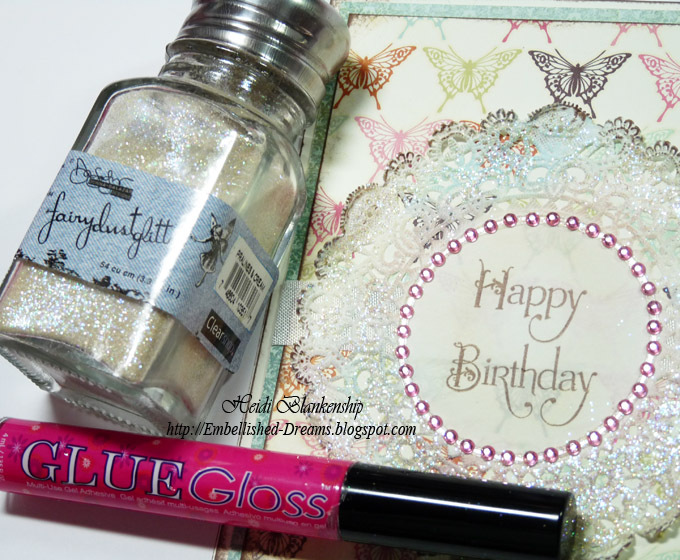 Then I used Glue Gloss along the edges and added Pralines & Cream Fairy Dust Glitter from Clearsnap. 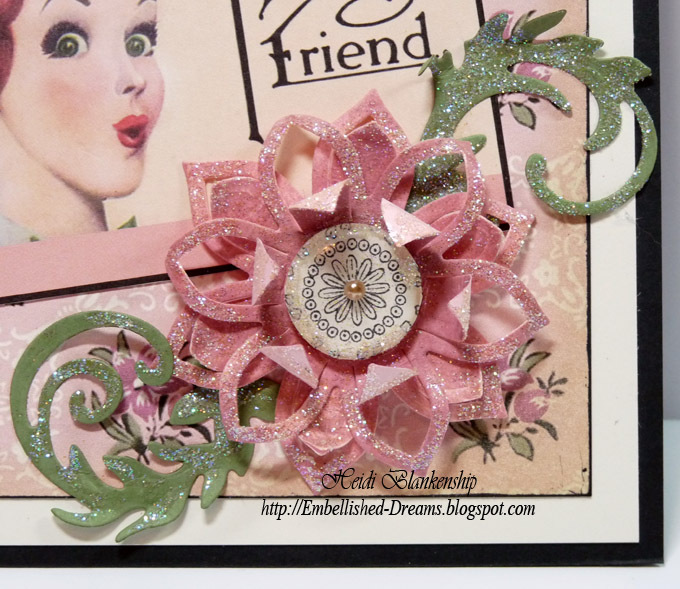 For a finishing touch I added Finesse Swirls Brown Rhinestones from Want2Scrap™ and a Seam Binding bow. Thank you so much for stopping by today and I hope you have a Wonderful & Creative Day!! 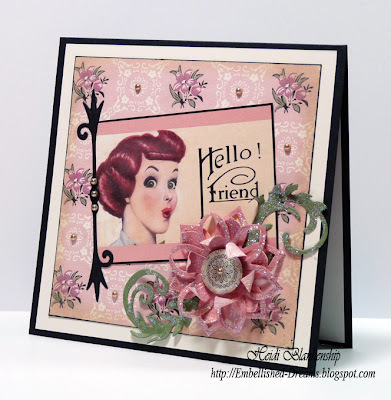 Crafty Secrets DT Challenge "Retro Inspiration"
Good morning blogging friends! 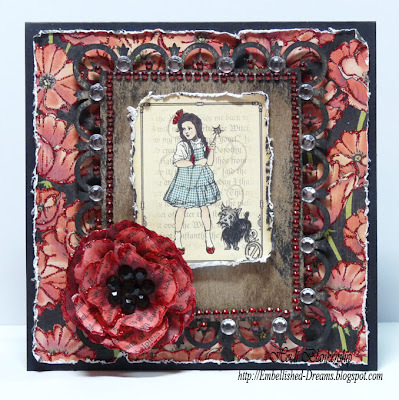 Today, is the Crafty Secrets Design Team Challenge. 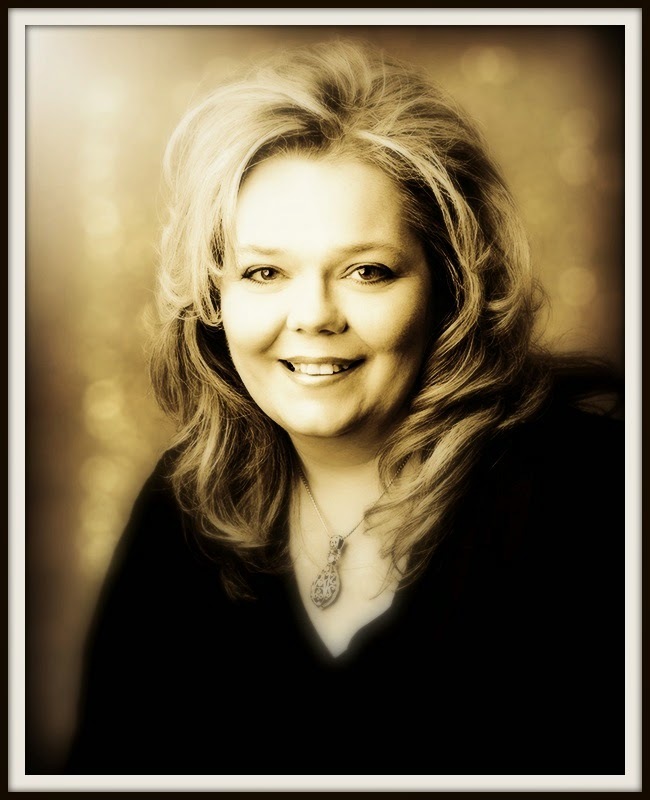 Each month our DT Coordinator, Vicki Chrisman picks a theme for us to work with and this month the theme is Retro Inspiration. Here is the card that I designed for the challenge. The fun image of the lady is from the Girlfriends Creative Scraps. The floral background paper was printed from the Creating With Vintage Patterns CD. I simply hand cut the image around the black frame and added an die cut to the side as an accent piece. 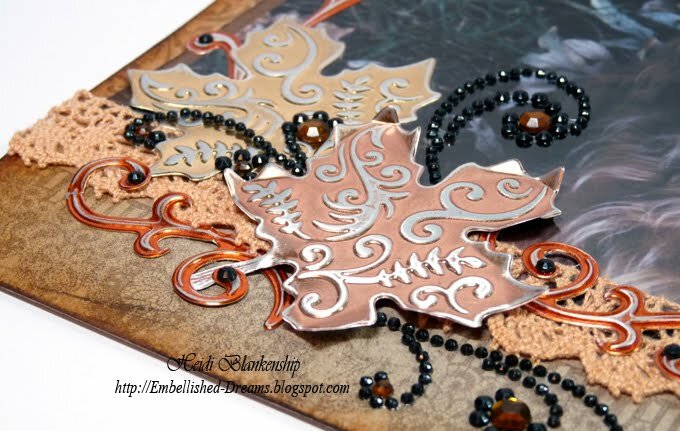 I used S5-071 Twisted Metal Tags and Accents from Spellbinders™. Here is a close up of the designer paper. The Creating With Vintage Patterns CD has over 70 Color Pattern Papers. In the lower right corner I made a flower with leaves to match the designer paper using Frosted Pink Prismatic, Herbal Garden Medium Prismatic, S5-067 Anemone Flower Topper and S4-327 Floral Flourishes. For the flower center I stamped one of the images from Lacey Patterns Stamp Set on to Ivory paper and then placed a 1/2 Clear Epoxy Circles on top of the image and hand cut. I added the flower center, curled the petals and then added Pralines & Cream Fairy Dust Glitter. 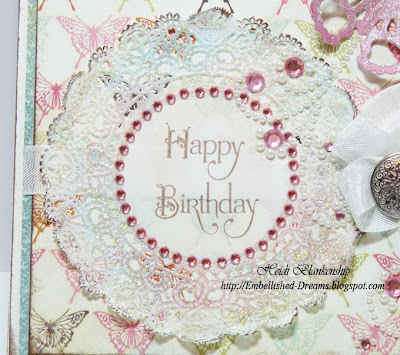 For a finishing touch I added a few Baby LeCreme Pearls from Want2Scrap™ to the card. 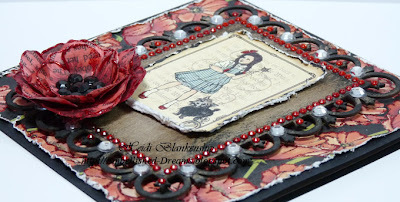 Please be sure to visit each of the Crafty Secrets Design Team Members so you can see what they have been busy creating. Thank you for stopping by today! I hope you enjoy the blog hop and have a creative day! !